With two other students (Corentin Fatus & Vincent Lorant) we decided to create a mixed reality experience on our free time. This project was created for the Virtual Fantasy competition, which is part of the Laval Virtual exhibition in Laval, France. Our goal was to create a pleasant experience, where the player explores a dreamlike world. Overflown is an experiment that gives the user the power to control wind. This is a mixed reality experience that associates a dreamlike world with tangible elements. The user affects the strength and the direction of the wind with his movements. Therefore, he can control the trajectory of a virtual soap bubble to avoid obstacles standing on its way. The goal is to help the bubble reach the end of its journey without making it pop. A Kinect camera captures the movements of the user's hand and sends the data to the computer. A video projector displays a visual feedback of the experience on a large white screen. Propellers are made of paper and rotate using small motors connected to an Arduino board. An Arduino board controls the propellers and the bubble machine. The entire experience is controlled by a computer. It is the brain of the operation. A bubble machine is connected to the Arduino board. It mechanically creates dozens of tangible bubbles around the user. 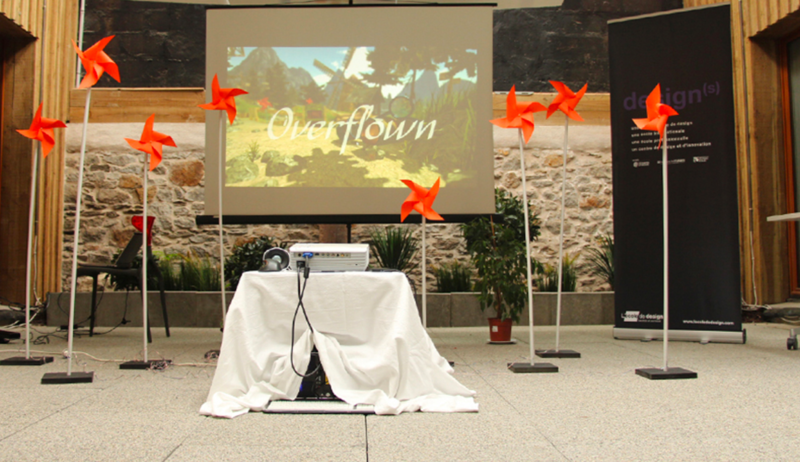 Overflown was initially made for the Virtual Fantasy competition at the Laval Virtual exhibition, where it received the award for the best graphics. the Digital Week in September 2014. 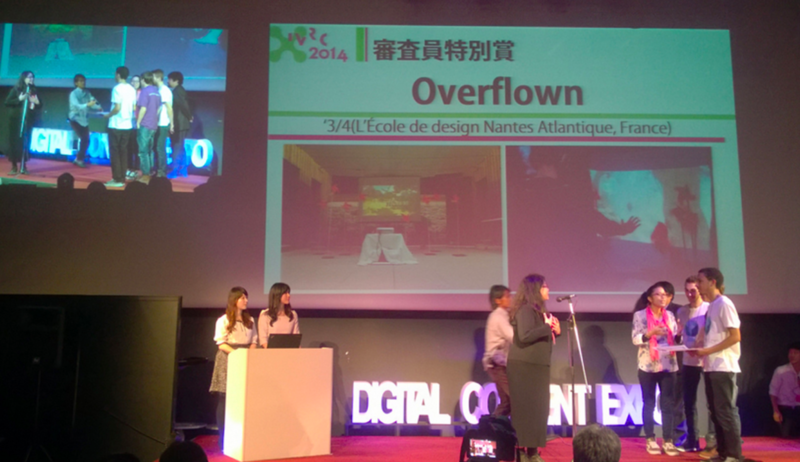 In October 2014, we presented Overflown at the IVRC (International collegiate Virtual Reality Contest) - which was part of the Digital Content Expo, in Tokyo - and it won the Special Recognition Award.